For more information on the U.S. Postal Service’s role in distributing medical countermeasures following a biological attack, see Carlton Purvis’ article for Security Management magazine. “Sec. 2. 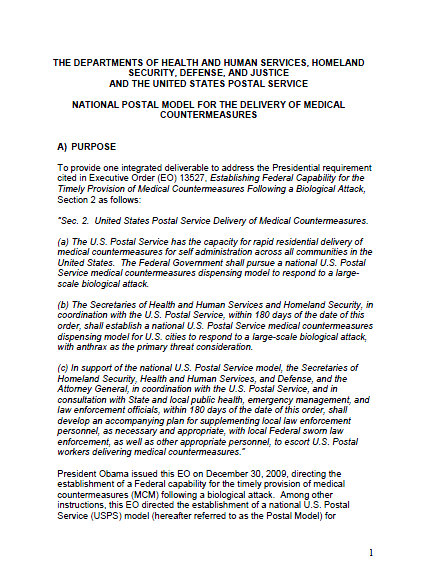 United States Postal Service Delivery of Medical Countermeasures. (a) The U.S. Postal Service has the capacity for rapid residential delivery of medical countermeasures for self administration across all communities in the United States. The Federal Government shall pursue a national U.S. Postal Service medical countermeasures dispensing model to respond to a large-scale biological attack. (b) The Secretaries of Health and Human Services and Homeland Security, in coordination with the U.S. Postal Service, within 180 days of the date of this order, shall establish a national U.S. Postal Service medical countermeasures dispensing model for U.S. cities to respond to a large-scale biological attack, with anthrax as the primary threat consideration. President Obama issued this EO on December 30, 2009, directing the establishment of a Federal capability for the timely provision of medical countermeasures (MCM) following a biological attack. Among other instructions, this EO directed the establishment of a national U.S. Postal Service (USPS) model (hereafter referred to as the Postal Model) for residential delivery of MCM following a biological attack as quoted above. This Postal Model is one potential option that States or Municipalities could consider as a supplemental method for rapid MCM distribution. In the event of a large-scale outdoor release of an antibiotic-susceptible biohazard, such as B. anthracis, antibiotic prophylaxis will need to be delivered to the potentially exposed population within a short time frame, ideally within 48 hours of exposure, to avert the onset of disease. Scenarios placing large numbers of people at risk for infection could potentially overwhelm the capacity of SLTT authorities to respond via their traditional response modalities within the necessary time frame. Postal Model operations are based on the underlying CRI scenario – initial prophylaxis to the entire population of a large geographic area within 48 hours of the decision to deploy SNS medications. In light of these concerns, the USPS could provide for distribution and delivery of antibiotics to residential addresses in affected metropolitan areas during the initial stages of such an event. The sudden and catastrophic nature of such an event may warrant this departure from normal public health and medical practice. These procedures would be planned for in advance of an event, and would augment, not replace, other local dispensing plans. Local public health Point of Dispensing (POD) locations will also dispense initial starter packs as well as supplemental resupplies of antibiotics in the affected area. Jurisdictions desiring a fully capable Postal Plan response are required to engage in SLTT planning with the cooperating Federal agencies to prepare venue-specific Postal Plans to ensure coordination across emergency response mechanisms. USPS facilities are not available as POD sites. USPS employee volunteers will not distribute information sheets and/or antibiotics directly from Post Offices. Info sheets will only be delivered by USPS carrier volunteers in conjunction with the delivery of antibiotics to residences, not as a separate function. The USPS does not have nor maintain open warehouse space and thus cannot provide warehouse storage of SNS caches. USPS trucks cannot be utilized to transport medications or equipment from the State Receipt, Store and Stage (RSS) site, or any intermediate location, to a POD. USPS employee volunteers are to be solicited for roles and responsibilities relevant only to the Federally approved residential delivery model, and are not available for use as translators, non-medical staff, or as ad hoc resources at an existing POD. Locations such as nursing homes, hotels, universities (e.g., dormitories), or correctional facilities are single-point drop locations, not residential addresses, and therefore would not be a USPS responsibility. In cases where the USPS does not deliver to individual residences on tribal lands, the same exclusion would hold. The USPS will not selectively deliver antibiotics and information sheets within a ZIP Code (e.g., only to people with special needs, such as the homebound, or to a subset of routes within a ZIP Code); the decision to activate a Postal Plan will be made at a minimum on a ZIP Code basis. Therefore, deliveries of medication will be made to all residential addresses within a particular five-digit ZIP Code. The USPS will not provide route maps and access keys (for mail receptacles and buildings) to allow jurisdictions to execute a plan without USPS assets; nor will USPS carrier volunteers act as route guides for SLTT Public Health volunteers.